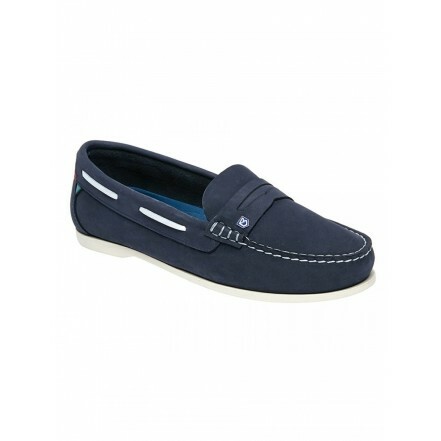 Dubarry&apos;s Belize slip-on women&apos;s deck shoe, is a hand sewn leather moccasin for women. It features a DryFast-DrySoft„ water resistant finish. A high performance women&apos;s boat shoe, Belize is ideal for on and offshore; this versatile leather deck shoe teams perfectly with shorts or ladies&apos; cropped trousers, ladies&apos; tops and shirts, and with women&apos;s waterproof jackets or summer jackets. Essential women&apos;s footwear to complete the yachting clothing look, Belize also complements urban fashion style. High performance, classic, slip-on hand sewn women&apos;s moccasin, with full Nubuck leather insock, on a slim rubber outsole. Water resistant DryFast-DrySoft„ soft Nubuck leathers. High performance NonSlip-NonMarking„ rubber outsole delivering superior grip in wet and dry conditions.